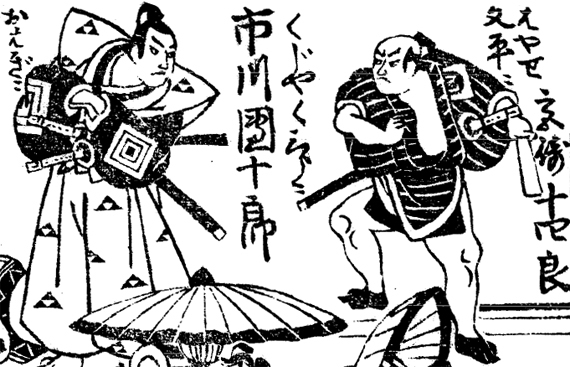 Before 1723: disciple of Miyazaki Jûshirô I, his first stage name was Miyazaki Jûtarô. He was adopted by his master at an unknown date. 25th day of the 2nd lunar month 1723 : his adoptive father Miyazaki Jûshirô I died. 11th lunar month of 1723: Miyazaki Jûtarô took the name of Miyazaki Jûshirô II at the Nakamuraza, performing as a tachiyaku in the kaomise drama "Sono Enpô Onna Migyôsho", which celebrated the arrival in Edo of the Kamigata actors Yamashita Kinsaku I and Sanogawa Senzô. 1st lunar month of 1724: Jûshirô's rank in the Edo hyôbanki, tachiyaku section, was (shiro)jô ((white) superior) [visual]. 11th lunar month of 1735: Jûshirô became katakiyaku and performed at the Ichimuraza in the kaomise drama "Kongen Nana Komachi". 1st lunar month of 1736: Jûshirô's rank in the Edo hyôbanki, katakiyaku section, was jô (superior) [visual]. 11th lunar month of 1749: Jûshirô performed at the Moritaza in Tsuuchi Jihê II's kaomise drama "Bijo Kurabe Kiso no Kakehashi", which celebrated the shûmei of Sawamura Sôjûrô II. 11th lunar month of 1754: Jûshirô played at the Nakamuraza the role of Nagao Shingo in the kaomise drama "Miura no Ôsuke Bumon no Kotobuki", which celebrated the shûmei of Ichikawa Danjûrô IV, Matsumoto Kôshirô III and Tsuuchi Monzaburô II. 1st lunar month of 1755: Jûshirô's rank in the Edo hyôbanki, katakiyaku section, was jô-(shiro)jô (superior - (white) superior) [visual]. Jûshirô played in the same theater the role of the brothel owner Denzô in the new year sogamono "Waka Midori Nishiki Soga". 2nd lunar month of 1763: Jûshirô played at the Nakamuraza the role Tone no Danjô in Kanai Sanshô's new year drama "Momo Chidori Ôiso Gayoi". 11th lunar month of 1763: Jûshirô played at the Nakamuraza the role of Kongô Bettô in the kaomise drama "Daijôbu Takadachi Jikki", which celebrated the shûmei of Ichikawa Yaozô II and Ichikawa Komazô II. 2nd lunar month of 1764: Jûshirô played in the same theater the role of Kajiwara Heizô Kagetoki in the new year sogamono drama "Hitokidori Harutsuge Soga". 11th lunar month of 1764: Jûshirô performed at the Nakamuraza in the kaomise drama "Azuma no Hana Sôma no Dairi". 1st lunar month of 1765: Jûshirô's rank in the Edo hyôbanki, katakiyaku section, was jô-jô-(shiro)kichi (superior - superior - (white) excellent) [visual]. 5th lunar month of 1765: Jûshirô played in the same theater the role of Ôta Ryôchiku in the drama "Kanadehon Chûshingura". 11th lunar month of 1765: Jûshirô played at the Nakamuraza the role of Hayase Bunpei in the kaomise drama "Kagura Uta Amagoi Komachi", which celebrated the shûmei of Iwai Hanshirô IV. 1st lunar month of 1766: Jûshirô's rank in the Edo hyôbanki, katakiyaku section, was jô-jô-(shiro)kichi (superior - superior - (white) excellent) [visual]. He was the kanjiku for katakiyaku actors. 11th lunar month of 1766: Jûshirô performed at the Nakamuraza in the kaomise drama "Kogane no Hana Kaijin Arasmusha", which celebrated the arrival in Edo of the Kamigata actor Kirishima Gizaemon I. 1st lunar month of 1767: Jûshirô's rank in the Edo hyôbanki, katakiyaku section, was fell to jô-jô-hankichi (superior - superior - half excellent) [visual]. 11th lunar month of 1767: Jûshirô played at the Nakamuraza the roles of the yakko Torahei and Tsumori Kuniharu in the kaomise drama "Taiheiki Shizu no Furisode". 1st lunar month of 1768: Jûshirô played in the same theater the role of Banba no Chûta in the new year sogamono drama "Fude Hajime Soga no Tamazusa". This was most likely his last stage appearance. 9th day of the 1st lunar month of 1769 : Jûshirô died in Edo . Miyazaki Jûshirô II was an Edo katakiyaku actor, who spent all his career in his native city from the beginning of the 1700s to the end of the 1760s. He was outstanding in yakko roles in the aragoto style of acting in jidaimono dramas. The 9th day of the 1st lunar month of the 6th year of the Meiwa era was the 15th of February 1769 in the western calendar. The 25th day of the 2nd lunar month of the 8th year of the Kyôhô era was the 31st of March 1723 in the western calendar. His tombstone was located in the precincts of the Unkôji Temple in Fukagawa.